What's an easy way to clean my make-up brushes? Have some clean rubber gloves laying around? They work fabulously for cleansing brush bristles. Or, give Bump It Off- the silicone tool that can be slipped over the fingers and has one soft tiny bristle side and another bumpy side to meet all of your cleansing needs. Need to reduce shine and don't have any primer or blotting papers handy? Tissue paper for gift wrapping works perfectly or take a tissue and separate into super thin layers and blot away! Trying to get that perfect line for eye shadow to get the ultimate finished eye look? Use a small strip of tape, post-it note, or post-it page flags [used to organize pages & folders] and easily remove once you've applied your shadows. Want to stay on trend with the perfect winged eyeliner look? 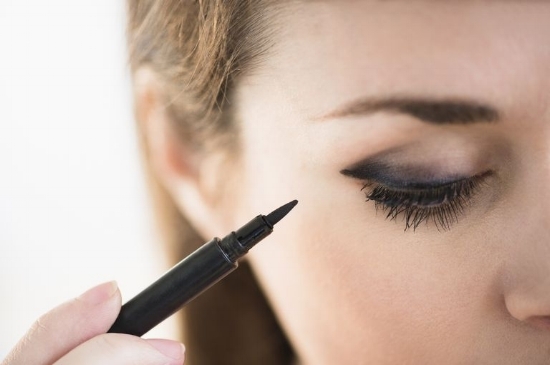 Take a bobby pin and spread apart about 1/4" and apply your fav liquid liner to both ends of the bobby pin and then immediately stamp on the outer corner of the eye [while the liquid is still wet!]. Reapply for the other eye and then fill in the winged corners created by ea. bobby pin stamp, following the line to the remainder of the upper lids with liquid liner to complete the look. Got a drawer full of broken eye shadows, lipsticks, and bronzers/blush? Powder shadows, bronzers, and blush can be broken up further in a small glass or ceramic mixing bowl [try mixing up different combos and adding in a bit of bronzer to make it sparkle and create a variety of your own pretty custom shadows, blush, and bronzers!]. Preheat your oven to 315 degrees F and use a cookie sheet with cookie cutters [the cuter and tinier the shapes, the better!]. Fill each cookie cutter with your mixed and crushed product; then apply 7-10 drops of argan oil [sweet almond, coconut, rosehip seed, & jojoba oils are great options too!] to ea. cookie cutter, stir with a chopstick/stick and then pop in the oven for 8-10 mins.]. Allow to cool and pop out by placing a towel on top of the pan and flipping over gently.